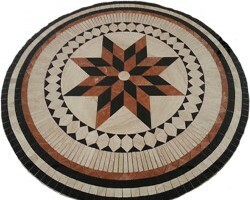 Medallions have been made for floors and walls for centuries. Medallions tend to make a classic and beautiful focal point in the dinning room, entrance way down a hallway, or in a bathroom. This timeless art we have had the privilege of continuing is truly inspiring. Occasionally we will hear from people who think medallions are outdated and old-fashion. But we tend to look at it and say the look is not out dated but what people may find is out dated. The 5/8ths by 5/8ths medallions and the medallions with wide spacing for grout we tend to find for our customers is a turn off. We tend to find that tighter joints and bigger pieces used tend to make our customers happier. 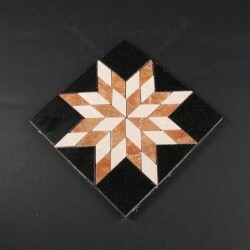 With our ability of making the medallions here in Las Vegas and allowing our customers of changing the colors to suit their taste and change the size to fit there needs our customers seem to love our creations and love showing them off to their friends. Even when people have bought the same medallion but choose different colors the medallions have a different look and feel to them. Such timeless pieces of art I cannot see going out of style. But as this year has progressed I have found that our more unique and captivating colors are being used more than the the traditional neutral colors. And when they are done they tend to look even better than the original designs.